Teenage boys tend to require a different level of structure than teenage girls do.Many teenagers try the whole, "you don't trust me" act, which is really a way of testing their parents and an attempt to make them feel guilty. There are some challenges parents will face as they raise their teenage boys. Once your little boy turns into a 'big' boy of thirteen, things may become much more challenging. Not only do teenage boys have testosterone flowing through them, they also tend to have issues with expressing their emotions in a healthy manner. Most boys grow up thinking that it is wrong for a boy to cry, show weakness, or display any real emotion. When boys become teenagers and hormones are flying high, anything may set them off on an emotional roller coaster. Teenage boys tend to require a different level of structure than teenage girls do. Your son may try various tactics to try to control how much you actually know about him and his whereabouts. Many teenagers try the whole, "you don't trust me" act, which is really a way of testing their parents and an attempt to make them feel guilty. There are some challenges parents will face as they raise their teenage boys. One of the most important things parents need to teach their kids is respect for other people's property and respect for others. Some teenage boys can fall into a disrespectful and destructive phase where they feel they have the right to deface property or destroy items that do not belong to them. (Or destroy things that are within the home that don't belong to them) Parents can teach their sons to respect people, places, and things from the very beginning be asking them how they would feel if someone damaged or stole their personal items. It is very important that sons learn how to handle money at a very early age. Parents can teach their teenage boys about money management and financial responsibility from a very young age. Give them the opportunity to work hard for something they really want. Give them a piggy bank to save their coins in. When they want to spend it all on candy, tell them that they won't be able to get what they truly want if they spend it. Learning how to save is important. Teenage boys need to learn to pitch in at home, and do his chores if he wants to have money for special items. Sometimes it can be challenging to get your teenage son to focus and understand that everyone in the family must work as a team and invest their time, emotion, and efforts to keep the family unit strong. (It can be challenging because teenage boys are highly distracted young beings!) They may forget that their involvement with the family and the household is extremely important to its success. Teach your son from a very young age that everyone in the family chips in and shares time with each other to keep strong bonds and family relationships nurtured. When you are talking to your teenage boy, use short sentences. Boys tend to absorb more when parents use direct, brief sentences. Then stop and wait for their reaction or response. When you are teaching your son about responsibility, (not lecturing!) or expressing your concerns to him, ask him to repeat what you said back to you. This can allow for deeper understanding and memory. Teenage boys require more opportunities where they can absorb what parents tell or teach them. When you are speaking to your son, try to keep eye contact with him. 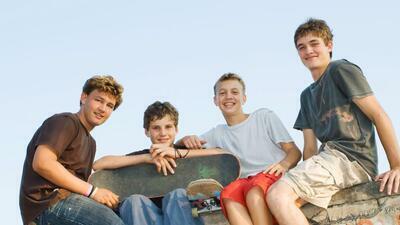 Teenage boys tend to avoid contact, especially when they feel uncomfortable or put on the spot. Make eye contact and gently touch him when you are speaking to him. It will help him stay focused on what you have to say. What do you find challenging with your teenage boy? Please share with us!